A simple yet brilliant concept - this site is a definitely for the savvy online consumer. Basically they pass the commissions from online merchants back to you the consumer. Now we aren't talking a measly couple of percent - you get all of it. 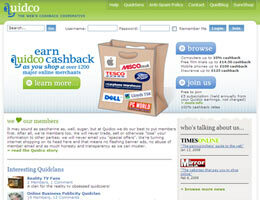 In their actual words - "Quidco cooperative is a cash back revolution" - it really is. You want to buy something - we will use car insurance for this example. Go to the Quidco.com site and go to their insurance section. You will find a list of merchants along with the expected 'cash back' amount. Select a merchant and you will presented with a button that will redirect you to their site. Complete your purchase with the merchant. Behind the scenes the merchant is tracking where the referrals are coming from. They then pay the referring site, in this case Quidco, the sale commission. This commission is then credited to you, and can be paid to you by Quidco via direct debit or PayPal. So what is the catch you ask? Well the only catch (which isn't really one) is that Quidco take £5 a year out of your earnings. If you don't buy anything and therefore don't get any cash back, they don't take the £5 admin fee. This site could literally save you hundreds of pounds a year.